Heard of Knife and Packer? Nope? Then it’s time you did. They write and draw very silly cartoon strips for famous grown-up mags like Private Eye. But they also do great kids’ books like Fleabag Monkeyface. Or like this book: Beth’s laugh-out-loud diary. Maybe you’ve read funny diaries before. But we’re pretty sure you’ve never read one like Beth’s. (Tip: it’s not for wimpy kids!) There are crocodiles. Fish fingers. Swamp monsters. Evil teachers. Oh yes – and loads of laughs. It’s sillier than a talking custard pie. 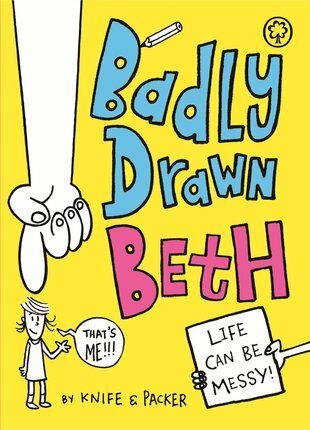 Winner of the Lollies Best Laugh Out Loud Book for 6-8 year-olds for Badly Drawn Beth.